I've talked about how to efficiently collect and analyze data on a golf course using google forms and google sheets on this blog. These free cloud based tools make is super easy to collect data in the field and have in instantly sorted and analyzed for use with decision making. The trouble with having multiple sheets for data collection is that you have to go to all these sheets to get the relevant data. 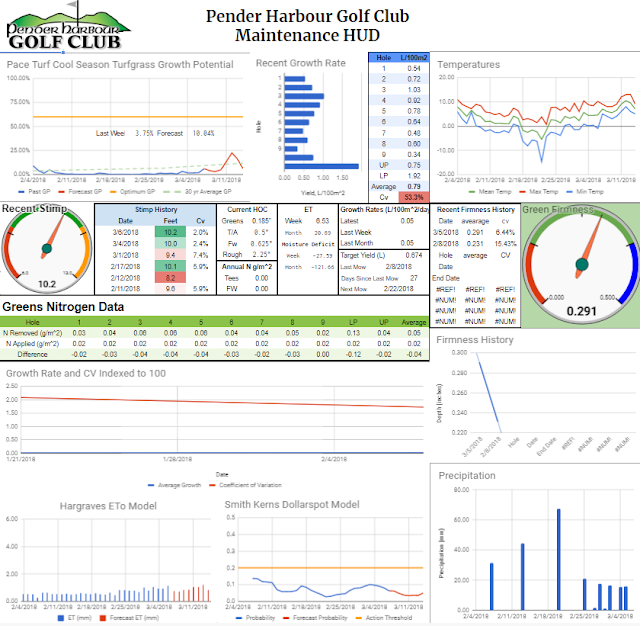 My turfgrass maintenance HUD (heads up display) solves that problem by aggregating all my data into one place. Now I can see all the metrics that are important to my agronomic decision making process. I threw everything I have at this preliminary HUD design. The idea is that I will cut out the stuff that I don't use but only time will tell what is useful in my day to day grass growing decision making process. The foundation of this HUD is the =importrange() function in google sheets. This function allows you to pull data from another spreadsheet into the current spreadsheet. This is how I get all the information into one spot. 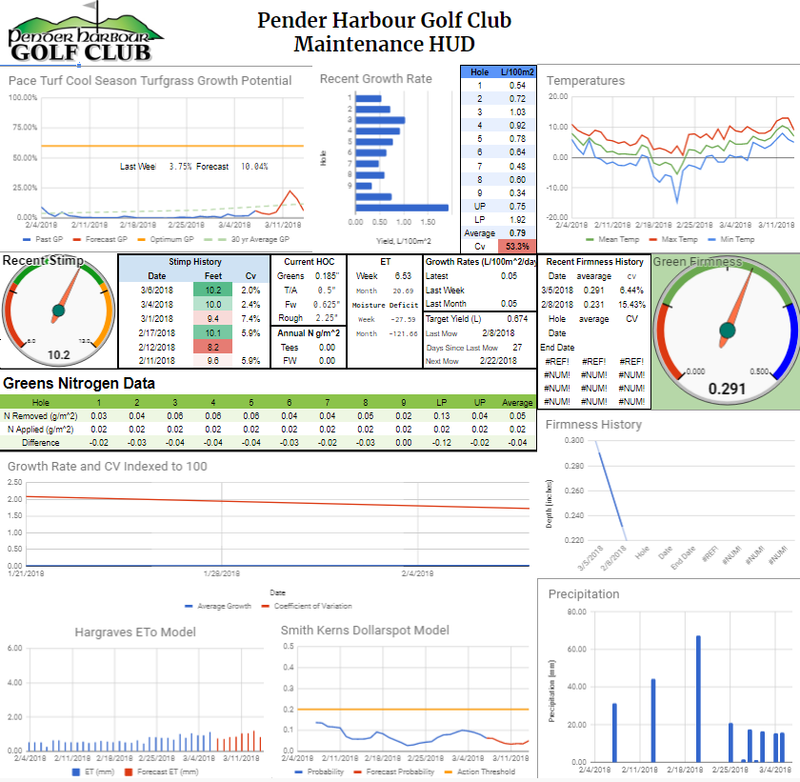 All of the weather data is pulled from my weather spreadsheet which automatically updates each day and calculates the growth potential, evapotranspiration rate, dollar spot potential and precipitation data. The growth potential data will help me understand the growing conditions. Whether it's too cool for growth or too hot I will be able to make more informed decisions about how much I push the grass based off of this data. I also pull this data into my fertilizer spreadsheet to help me determine my weekly fertilizer rates etc. My stimp data is pulled from my stimp meter reader sheet. 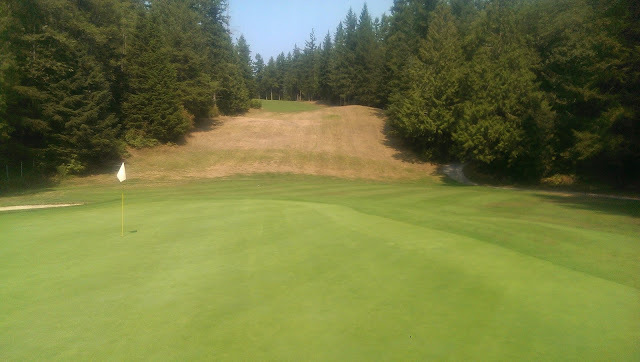 The growth rate data will give me a great idea of how fast the grass is growing and what kinds of issues I can expect whether it's disease, green speed issues, mowing frequency or clipping management. Some might think that all this data takes away the art of greenkeeping. I think it allows me to produce better art as my understanding of how my grass is growing is now compiled in one central location where I can use it to make the best decision based off of the facts. Does Aerification Make Disease Worse?